Nicky and Sila Lee present five sessions that make up The Parenting Teenagers Course. Their talks are interspersed with thoughts and feedback from parents and guardians who have completed the course, as well as street interviews with parents and children from around the world. Each of the five sessions includes two parts, making it possible for the course to also be run over ten weeks. The DVD includes English subtitles. Each DVD also contains one copy of the Leaders' Guide. The Parenting Teenagers Course DVD With Leaders' Guide by Lee is published by Alpha and is our 5657th best seller. 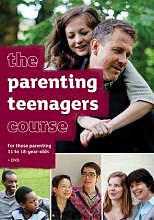 The ISBN for The Parenting Teenagers Course DVD With Leaders' Guide is 5060059401680. Be the first to review The Parenting Teenagers Course DVD With Leaders' Guide! Got a question? No problem! Just click here to ask us about The Parenting Teenagers Course DVD With Leaders' Guide.